One of Robin’s specialties is as a leader of family and community dances. She is a popular caller for all kinds of gatherings: school and church events, community and dance organization groups, wedding receptions, special family celebrations, retreats, or conferences. With a repertoire that includes a wide variety of "user-friendly" dances from the United States as well as other countries around the world, Robin welcomes dancers of all abilities and ages. The dances can range anywhere from gender-free partner dances and mixers, to non-partnered circle dances - something for everyone! - A Parent OrganizerThe best way to enjoy a community dance is with live music, but that isn’t feasible, then Robin can bring lively pre-recorded music. Booking enquiries. 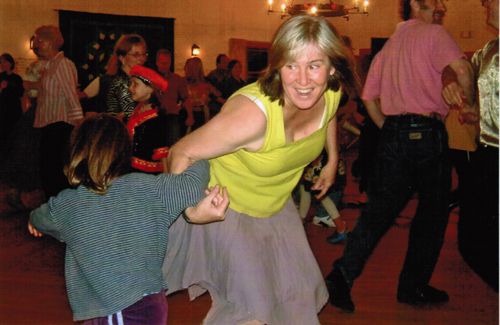 Read an article about Robin teaching family folk dance.